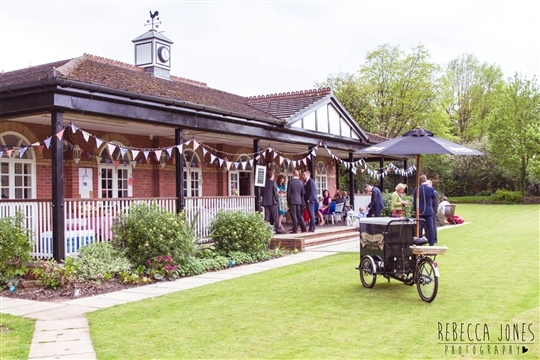 Lymm Lawn Tennis & Croquet Club is the perfect location for your special event. Our clubhouse has hosted weddings, private parties and corporate events. Set in woodland, perched high above Lymm Village centre, our tennis club is both centrally located and secluded. Our clubhouse is designed in a classical pavilion style and has a lovely big verandah where your guests can relax away from the main event indoors. If you're looking for a unique venue thats full of charm, look no further. Why not make a booking enquiry today? Our clubhouse can cater for groups of up to approx. 100 and the croquet lawn has hosted many marquee events. Charge: £170 which includes hire charge, staff, cleaning etc. (If a late licence is required there is an additional charge of £30. Music and last orders is at midnight). Membership: To hire Lymm Tennis Club you need to be at least a Social member for insurance purposes. Social Membership is £30 per year. Catering: We offer you the option of catering yourself, getting caterers in or adding to your event with a street-food style van. Contact: If interested, and to find out about available dates, phone Jenny Stubbs, Social Secretary on jas33131@gmail.com.